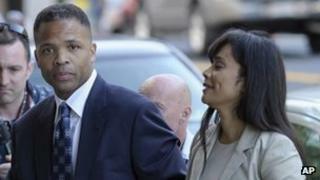 Former US congressman Jesse Jackson Jr has been sentenced to 30 months in prison for misusing campaign funds. Jackson, 48, pleaded guilty in February to fraud after he spent $750,000 (£483,000) on a Rolex watch, fur coats, mounted elk heads and other items. The Illinois Democrat's wife, Sandra Jackson, who pleaded guilty to filing false tax returns, was sentenced to one year in prison. The disgraced politician was once seen as a possible presidential candidate. Prosecutors had recommended a four-year prison term for him. At the court in Washington DC on Wednesday, District Court Judge Amy Berman Jackson said that as a public official Jackson had been expected to "live up to a higher standard of ethics and integrity". Just before he learned his fate, Jackson made an emotional speech to the judge in which he apologised to the American people, his family and his father, the civil rights leader Jesse Jackson. He told the judge he hoped his son and daughter would not be affected by the sentences and that his wife would receive probation. If not, Jackson said, he would serve her sentence for her. "Give me her time," the former lawmaker urged the judge. Prosecutors have suggested separating the jail terms so one parent could care for the couple's two children. Jackson has said he would like to be sent to a prison in the state of Alabama, where it would be "a little inconvenient for everybody to get to me". In letters to the court, members of Jackson's family appealed for leniency, with his father saying: "Jesse Jr is an example as a teacher and counsellor who will be better served under supervision and probation." Jackson resigned from the House of Representatives last November, months after his diagnosis with bipolar disorder. But prosecutors have said they do not believe Jackson's mental health affected the "3,100 illegal transactions that occurred during the life of the conspiracy", according to court documents. They say that between 2007-09, the Jacksons used funds donated to his re-election campaign to buy a gold-plated Rolex watch worth more than $43,000, fur capes and parkas worth over $5,000, as well as nearly $9,600 on children's furniture. Jackson was also accused of failing to report $28,500 in gifts and loans to the House of Representatives, where he had served from 1995. Accusing the politician of greed, prosecutors said the couple had a combined income of about $300,000 at the time they were spending the campaign money. They also disagreed with Jackson's argument that his crimes had no victims, saying the former congressman had deceived voters and undermined the democratic process.